What is the connection between escalators and elephants? Find out from David Waboso who shares some infrastructure insight in his latest column. Last year, London Underground – the world’s first underground railway – celebrated its 150th year of keeping London moving. When the Underground first formed, it was an amalgamation of several independent train companies – the Metropolitan Railway, the City & South London Railway, the Waterloo & City Railway, and so on. The combination of these lines – and the addition of many more over the years – has left Londoners with a superb network that criss-crosses the capital. But it has also left us with a huge challenge. As we carry out the biggest investment programme in 60 years, we are trying to make a lot of non-standardised infrastructure built in the Victorian and Edwardian eras fit for the 21st century. "In the first two months of work, we transported 456 tonnes of waste by hand out of the station for recycling. That’s the equivalent weight of 114 elephants!" 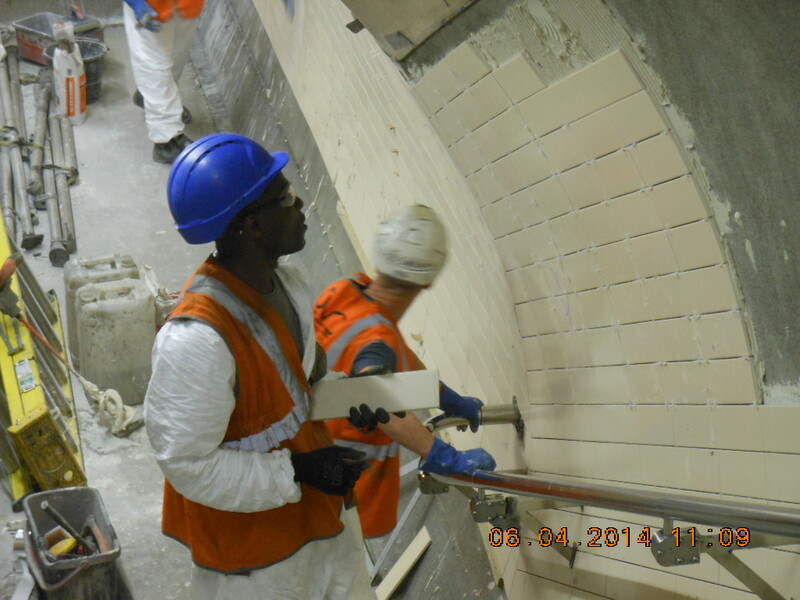 A timely example is the replacement of four escalators currently underway at Embankment station. Replace four escalators – sounds simple, right? Well unfortunately, it’s not. 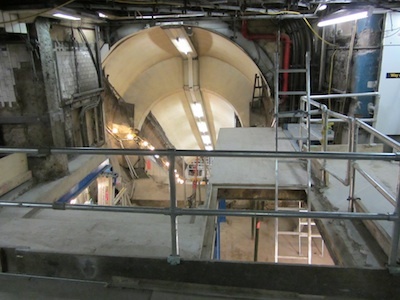 The original escalator structures at Embankment are actually integrated with the overall station structure so replacing them involves significant structural building work in addition to the delivery and installation of the new escalators and integrating their balustrades with the station. The replacement of these escalators, which began in January, will take ten months to complete mainly because of the sheer amount of demolition and civil works required. In fact in the first two months of work, we transported 456 tonnes of waste by hand out of the station for recycling. That’s the equivalent weight of 114 elephants! There’s also the sheer size of the escalators that further complicates matters. Unlike light duty escalators found in offices and shopping centres and which are delivered in one piece, our escalators are of a “heavy duty” construction because they have to last for 40 years and take a real pounding from the thousands of customers (and their luggage) who use them daily (some of our stations carry over 80 million customers a year, more than Heathrow airport). Embankment’s escalators have a vertical rise of seven metres, and if laid flat, rather than inclined, they would be over 18 metres long. The approximate weight of each being installed, including the balustrade, is 20 tonnes and contains approximately 15,000 moving parts. There is a real challenge in getting these large machines into the Underground as access is restricted due to stairs and corridors with bends. The truss sections (the structural support for the escalator) have to be delivered in smaller modules due to the space limitations within the station passageways. These modules, which can weigh up to five tonnes and be three metres long, must be carefully manoeuvred from the street down to deep tube level and then re-assembled within the new escalator shafts. We are moving towards greater standardisation - we are replacing the old escalators with standardised new models across the Underground, which brings whole-of-life efficiencies. We’re also standardising other parts of the Tube. For example many of you will have seen the new “S Stock” trains being rolled out on the Metropolitan, Circle, Hammersmith& City and District lines. For the first time in our history we have a single “type” of train on multiple lines, which leads to all kinds of advantages through the lifecycle. 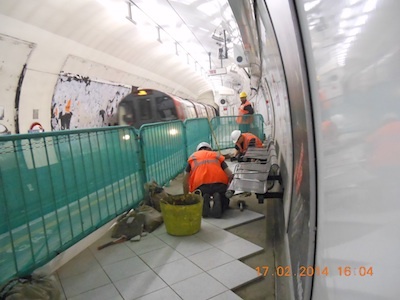 We’re also making the most of the partial closure required by the escalator replacement works. Another team has been busy carrying out improvement works: retiling, repainting, installing new stairways and communications systems, and replacing the station’s 500 lights with more efficient and environmentally friendly models. In fact, these new lights will save enough power to run a flat screen TV for 180 hours, every day. The work at Embankment is just part of our £1.3bn annual investment programme to increase capacity and make journeys faster and more reliable. After decades of under investment, we’re playing catch up. We’re making a Tube that we hope reflects our great engineering heritage, and that the original engineers of the first underground railway would be proud of, that’s fit for our 21st century customers.